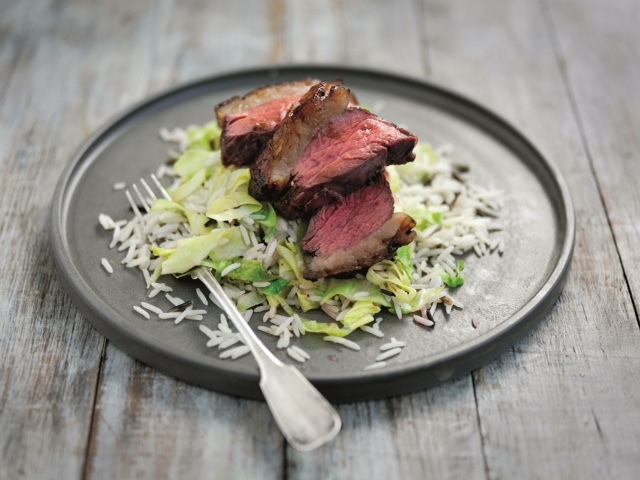 I was recently treated to a hamper of goodies from Simply Beef and Lamb, which included the picanha cut of beef – the corner cut of the rump, a recipe and the ingredients to make picanha mini roasts with miso glaze. This recipe was created to match this particular cut of beef. Having had this cut before, when I slow braised it for a steak pie, I knew the meat had a wonderful flavour so I was excited to be cooking it again. The miso glaze made a delicious addition and went really well with steamed winter cabbage and wild rice. Unfortunately, I think my oven may have produced a higher heat than the suggested one as, after cooking for the recommended 25 minutes, the meat was completely overcooked and chewy. I would like to try this recipe again but, as ovens often vary in temperature I would like to fry the meat on a griddle and drizzle with the miso glaze before serving. In a small bowl mix together the glaze ingredients to form a paste. Put the picanha roasts on a chopping board, season and brush portions with the glaze. Position on a rack in a roasting tin lined with foil and roast for 25-30 minutes, cover with foil if browning too quickly. Serve the beef with steamed winter cabbage and rice. Tip: This glaze works well on steaks too.